So I thought with the new Year and so many new followers and subscribers it seems like the perfect time to introduce myself in a bit more detail. 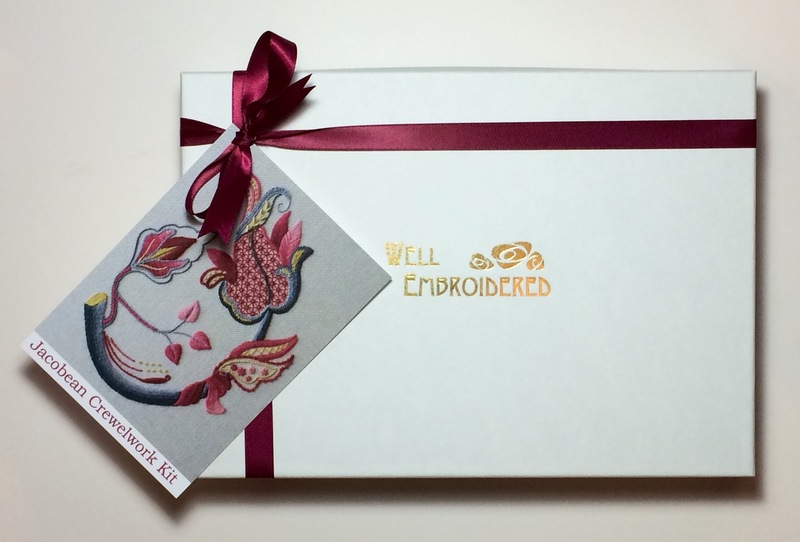 My name is Sara Rickards (Meanwell) and I have been working in the embroidery world since I graduated from the Royal School of Needlework‘s apprenticeship in 2006 at just 20 years old. When did I know I wanted to be an embroiderer? Coming from a crafty family (my mum and dad, yes dad were always knitting or doing some patchwork) my mum started teaching me how to make my own clothes at 8 years old. The first piece I made was a waistcoat out of my old lilac, floral curtains. I remember flicking through the OK catwalk magazine when I was 12 years old and a stunning but simple white Valentino dress jumped out of the page at me and that is the exact moment I knew I wanted to be part of that world. I didn’t know I wanted to do embroidery specifically, in fact like all little girls I wanted to be a fashion designer, but either way I just knew I had to be involved with the making of such beautiful art. It wasn’t until my mum found an article in The Lady magazine about the Royal School of Needlework that I really considered embroidery as a career. At 15 years old I applied for the apprenticeship and got in, although I had to finish school first. What is my favourite embroidery technique? It’s so difficult to just pick one. 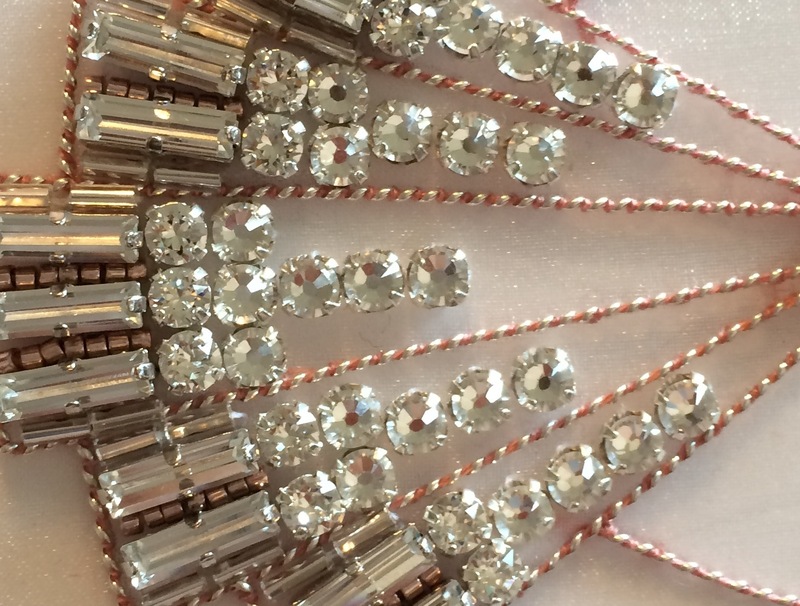 I think my favourite to sit down and do is tambour beading. It was one of those techniques that didn’t come easy to me, in fact it took me 30 minutes to work a 5cm length when I first tried it. However the patience paid off. It’s very rhythmic and now I find, very therapeutic technique. I can just switch off and work away. I also really enjoy goldwork, whitework and stumpwork and combining these techniques. They are all quite precise techniques and I very much enjoy the attention to detail and different textures that each one creates. What is my favourite embroidery technique to teach and why? 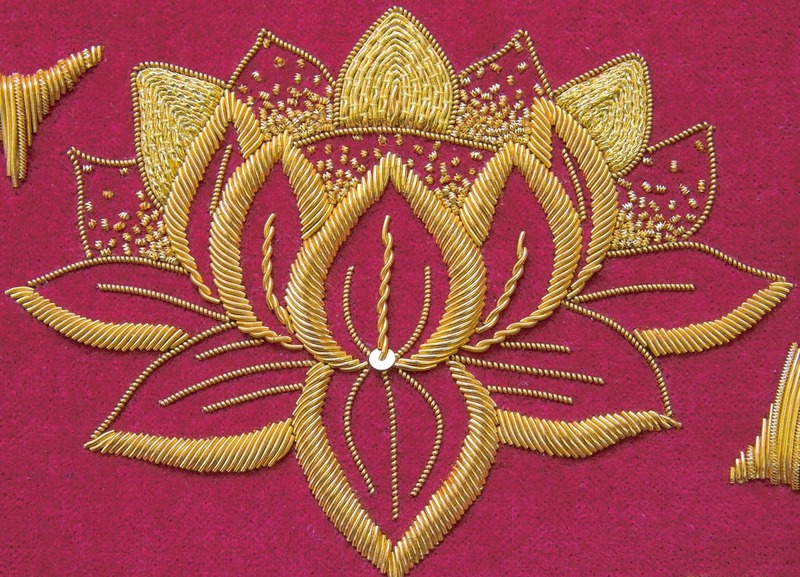 I teach every Tuesday on the Royal School of Needlework’s Certificate and Diploma course. 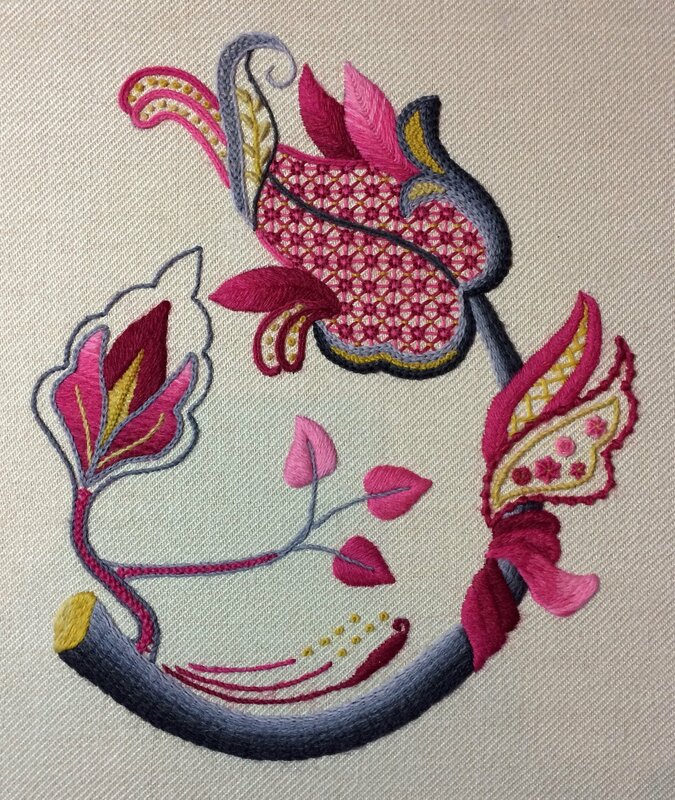 The first module the students take is Jacobean Crewelwork. Often students come in with very little embroidery experience and a little nervous and I love to be in the position of teaching them their first few stitches. Seeing their designs come to life and a completed piece at the end of 8 lessons really makes me feel proud of what they have achieved and they never thought possible in the first lesson. I believe embroidery should be fun and creative which is what I try to bring to each class. While I personally like being technically accurate and neat with my embroidery, life is too short not to be enjoying what you are doing in that moment. Any embroidery techniques I don’t like? Yes of course. Sadly, silk shading. It is a technique that doesn’t come naturally to me. Although I love how it looks, it is quite a creative technique and requires that bit of flare that I am not sure I possess. This is why I have the lovely Margaret Dier’s book on silk shading. I am hoping I can sit down and get some more practice in soon. I am much more of a technical, this stitch has to go there type of embroiderer (those that stitch, will know what I mean). What is my favourite piece of embroidery I have ever done? I actually have two. The first is a dress I did for Kate Moss. 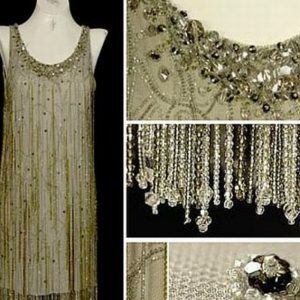 It was inspired by a 1920’s dress she wore when she first meet Johnny Depp. The dress was for Swarovski Fashion Rocks and covered in over 80,000 Swarovski crystals. It took 3 of us, 6 weeks to make if I remember correctly. The second would have to be my wedding dress. In September 2017, I married the most wonderful man in the stunning town of Positano. I had the dress custom made by Shimmering Ivory and I designed and made the embroidery. The embroidery was inspired by the Art Deco period and I wanted to keep it very simple and elegant. All over the place. A lot of my designs are very floral based so I take my inspiration from the natural world, bright, tropical flowers and animals. 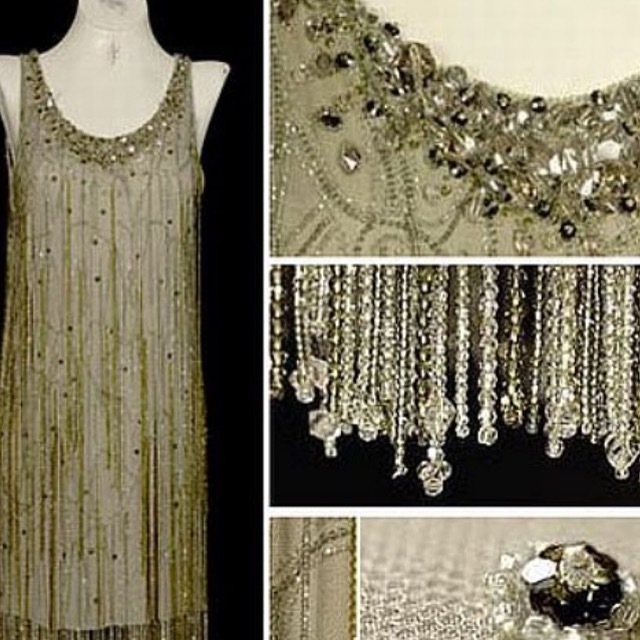 I also love the glitz and glamour of the Art Deco period and most of the pieces I work, have been influenced by one of these themes. From the idea of a kit design to finished product, how long does that process take? Most of my ideas will run around in my head for a while, sometimes years until I find the time or right project for that piece. Once the design is sketched out it can take between 10 hours (for a simple design) to 50 hours (for a more complex design) to be stitched. This includes changes to the design, sampling and sourcing fabrics. Then from there I have to write all the instructions and draw the diagrams in illustrator. This can take again another 40-50 hours or so for the more complicated kits. Having said that I am building up a small catalogue of stitches so this process is speeding up a little bit now. The next step is to source and order all the materials and prepare them for the kits. Cutting, ironing and transferring the design onto the fabric, cutting lengths of gold or making beeswax blocks, threading beads. Each kit is different but on average it takes about an hour to put together each kit. I always do everything in batches to keep this time as quick as possible. The final step is to put everything together and tie a big bow around the box that each kit comes in. You can have a look at my designs here. Each individual kit is lovingly put together. When someone sees the box I want them to feel excited, like it’s Christmas and they are getting a special gift. My heart and soul goes into each one and as my husband always says it’s been “Made with love”. Well I have a lot of ideas running around my head currently. 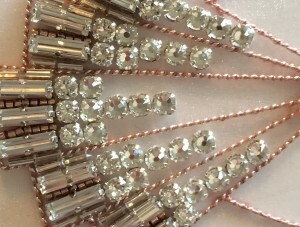 I would like to set up a regular embroidery workshop local to me in St.Albans, Hertfordshire, where people can bring any embroidery design or technique and get the tuition they need specific to them. I also want to set up some distance learning videos so people can get the classroom feel without the travel. I am also a big lover of travel and would love to combine teaching embroidery with travelling the world (if anyone is interested, drop me an email). And of course I am writing a book on Fashion Embroidery. So quite a lot to keep me busy over the coming years. I hope you enjoyed getting to know me a little bit better, any questions then I would be happy to answer, just drop them in the comments below. 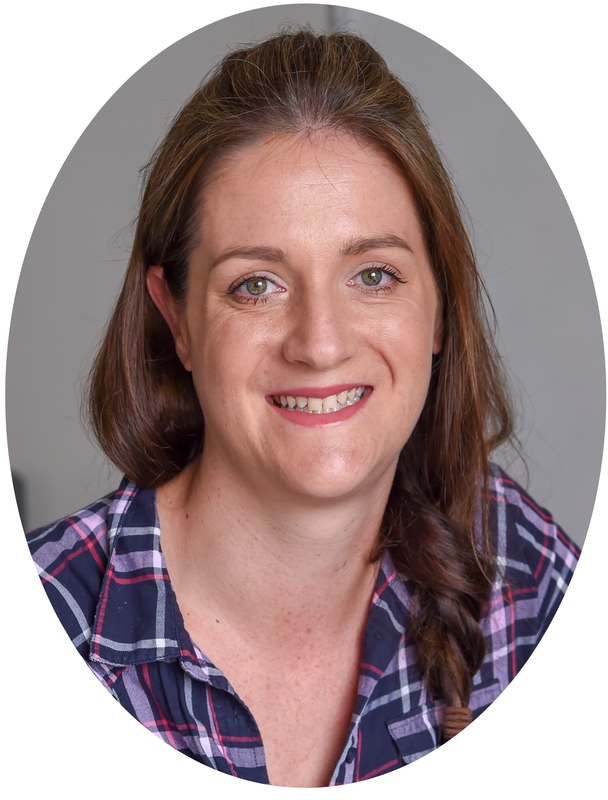 Hi Sara, Where can I find out about any upcoming workshops?